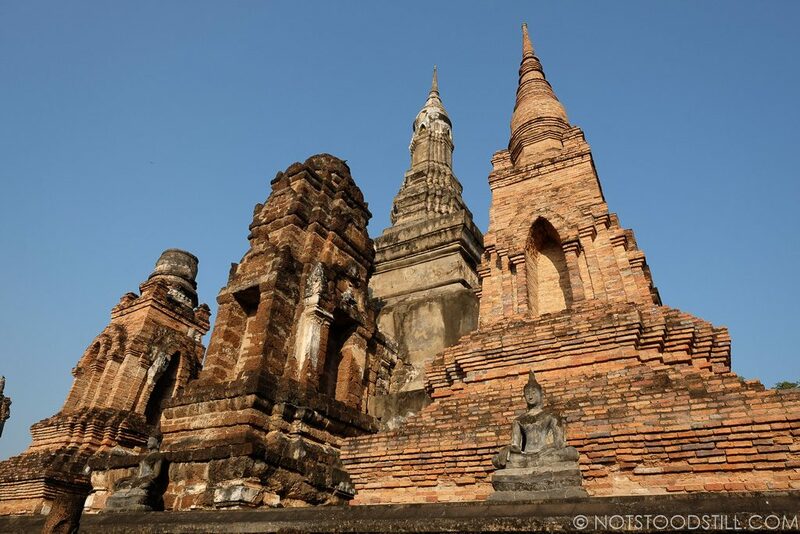 Around 420km north of Bangkok is the former capital of the Thai empire, Sukhothai. 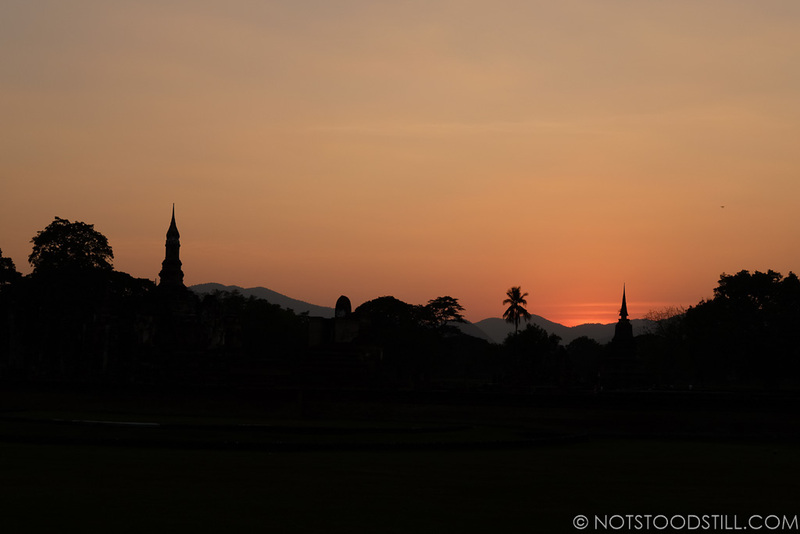 Getting here from Bangkok is very simple and there are a few different options. 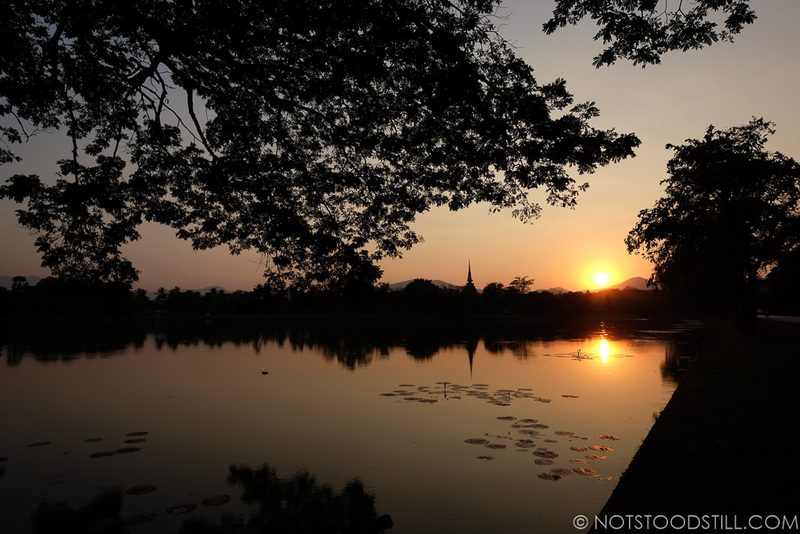 You can fly from Bangkok to Sukhothai with Thai Airways, and currently there are three flights a day. 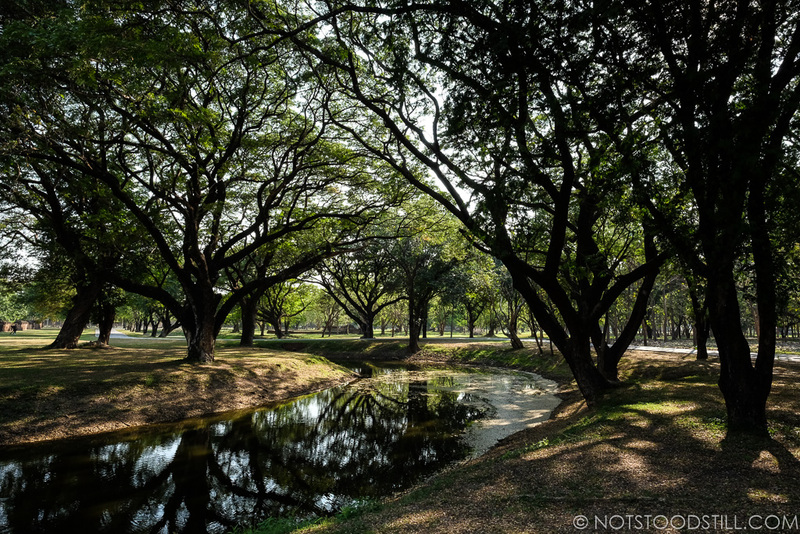 You can take a train from Bangkok to nearby Phitsanulok and then catch a bus onwards or you can simply take a direct bus from Bangkok’s Mo Chit station. The bus journey is comfortable and takes around seven hours. 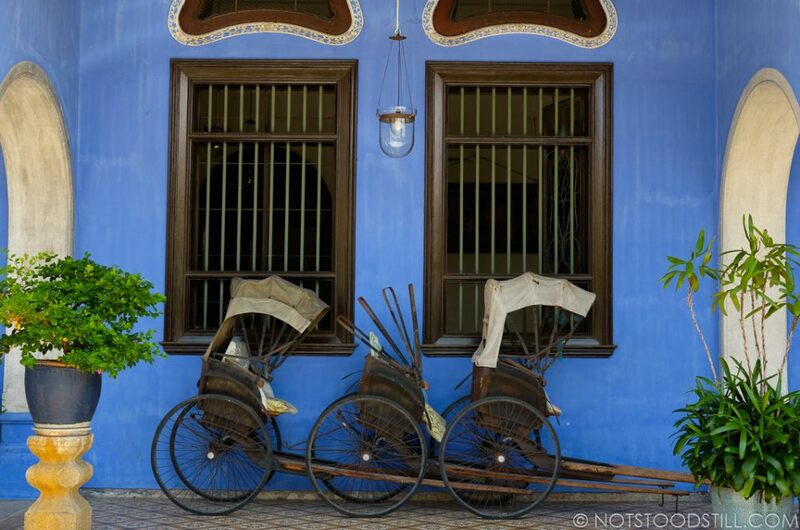 We stayed in the beautiful Blue House, a newly built guesthouse but ran more like a mini hotel offering affordable luxury – we highly recommend this accommodation. 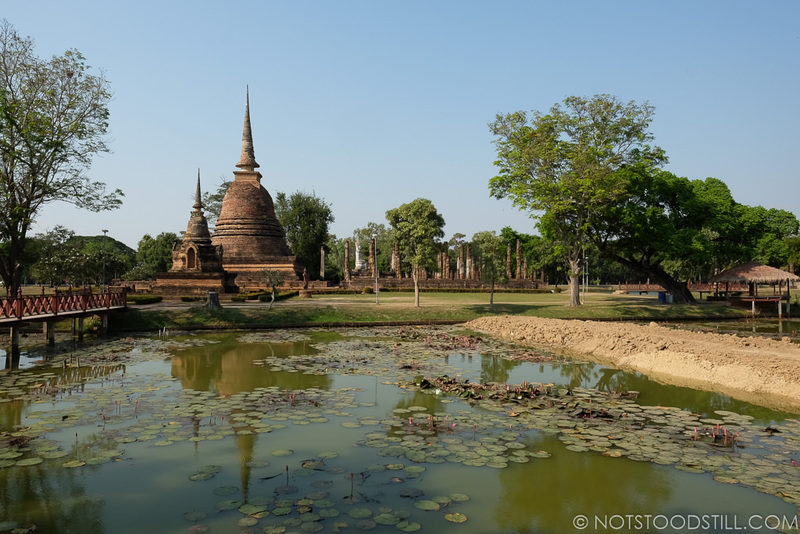 It is set back from the main road in New Sukhothai, quiet and close to the bus stop for the Old City. 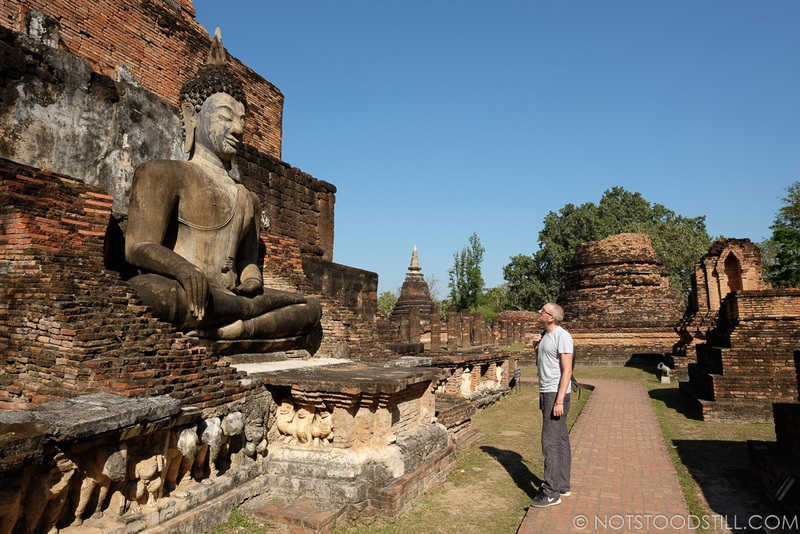 The main bus station is located in New Sukhothai (where we arrived from Bangkok). This is one of the deciding factors for us to choose to stay in the new part of the city. 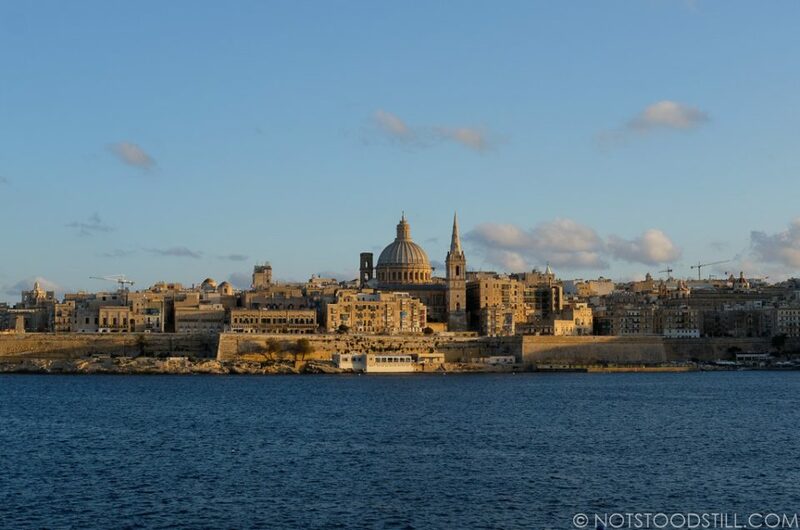 However the Old City is closest to the Historical Park and has just as many shops and resturants. 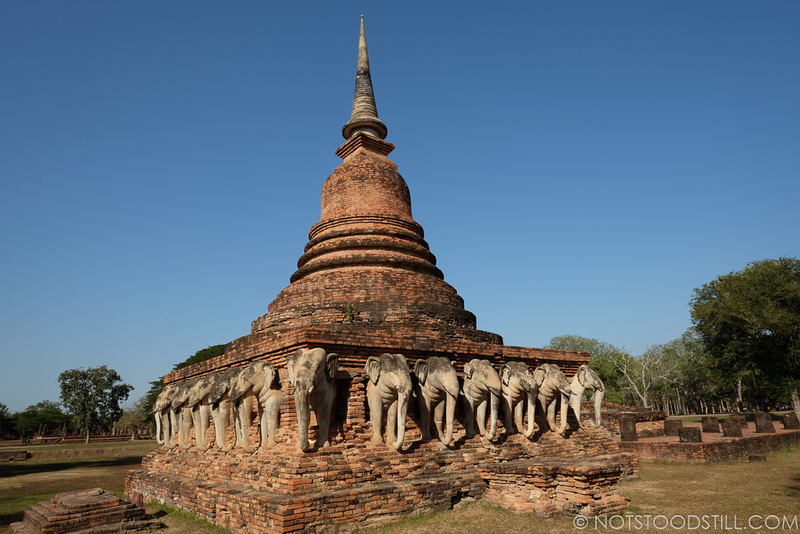 For more Sukhothai hotels and hostels, check out this list. 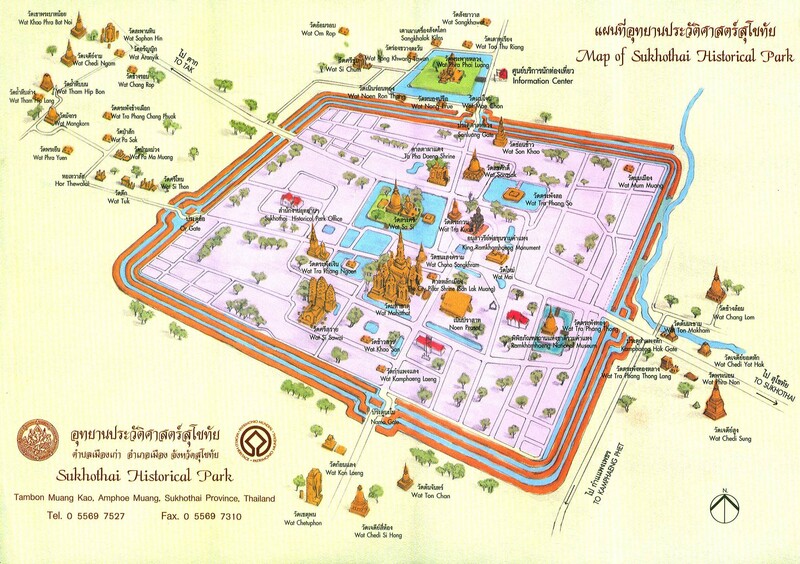 Wat Mahathat, a restored ruin at the centre of the Historical Park. 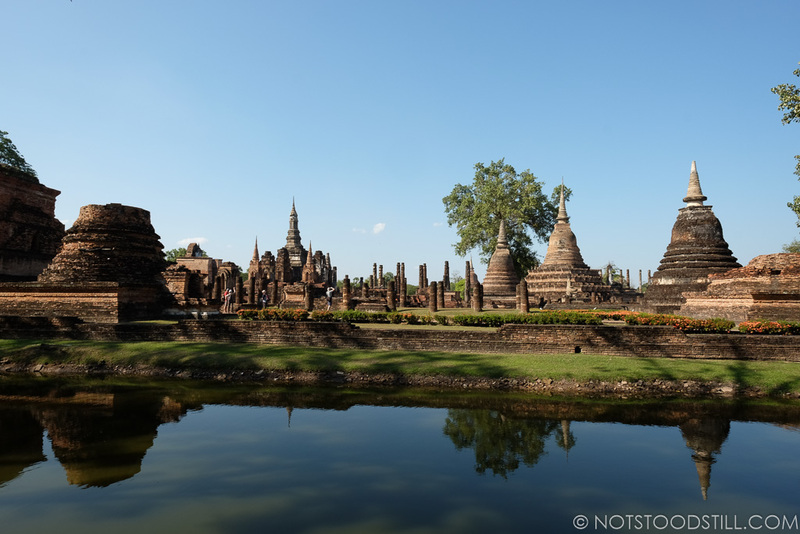 The main sight of interest here is the UNESCO World Heritage Site, the Sukhothai Historical Park in the old town. From the new town, there are regular buses which run for 30 baht each way. The journey takes around half an hour. 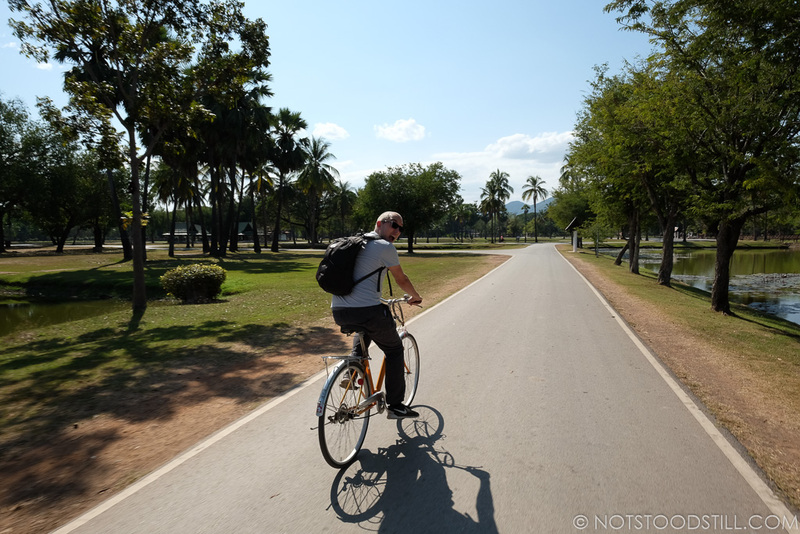 The ruins are very interesting and the best way to see as much as possible is to hire a bike for 30 Baht/day. There are several stores offering this when you get off the bus, and we rented from OR, where a day’s hire is 30 baht. The last bus returning to the new city is at 5.30pm, but after this there are tuk-tuks running for around 200 baht. 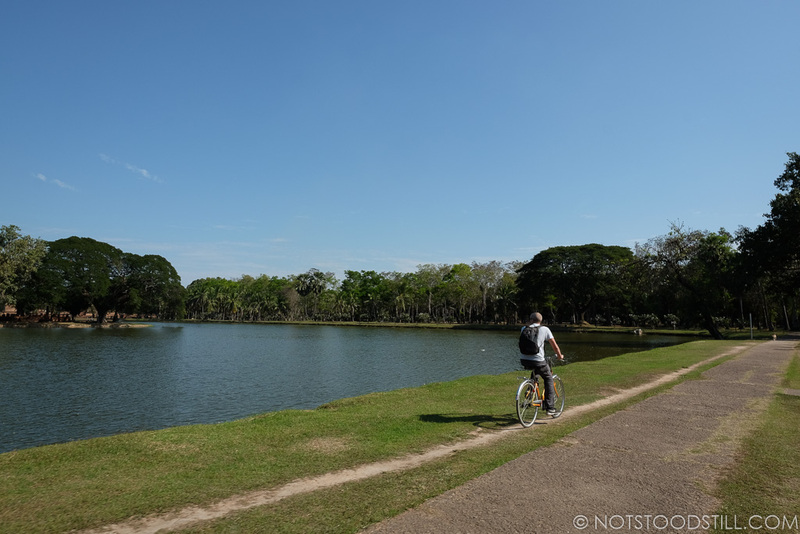 A tranquil park, with bike friendly paths. 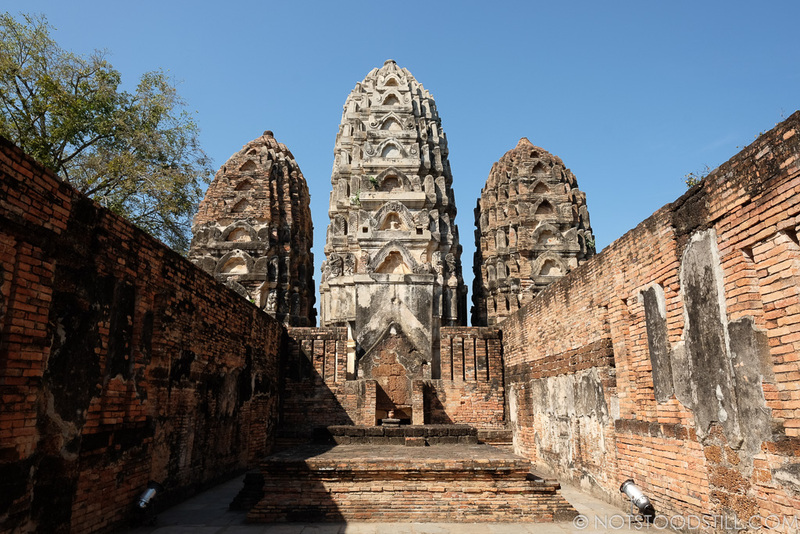 The Historical Park is spread out to other parts of old Sukhothai, if you are feeling adventurous after seeing all the main park, take your bicycle and head West towards Tak. 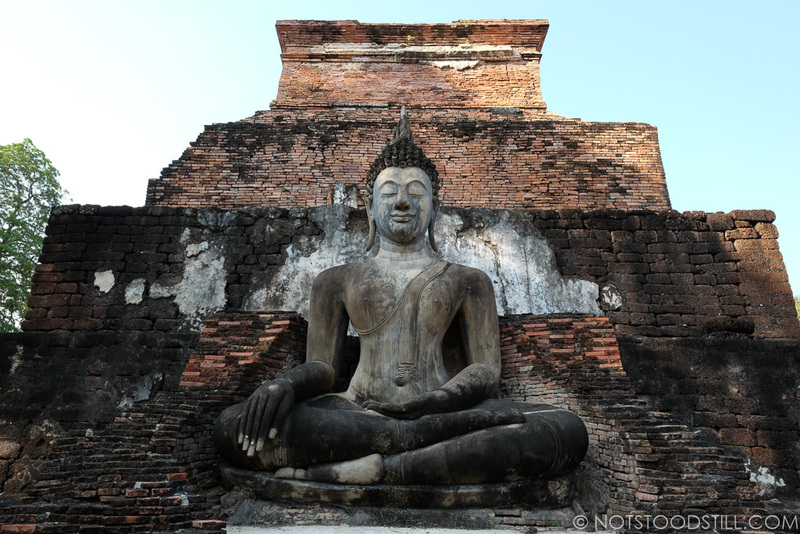 Wat Si Chum, with a giant Buddha is worth seeing (additional entry fee) but the surrounding park is free and nice to cycle around. 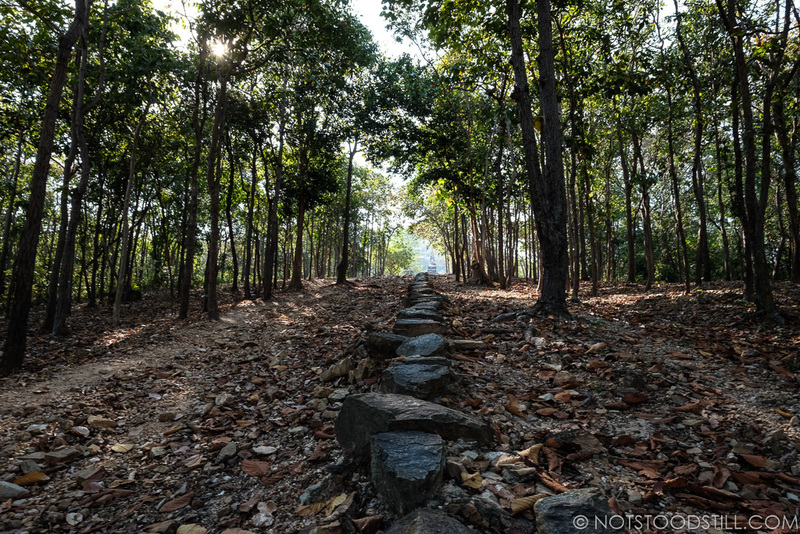 Rejoin the main road towards Tak and about 15 minutes cycle, turn left for Wat Saphan Hin. 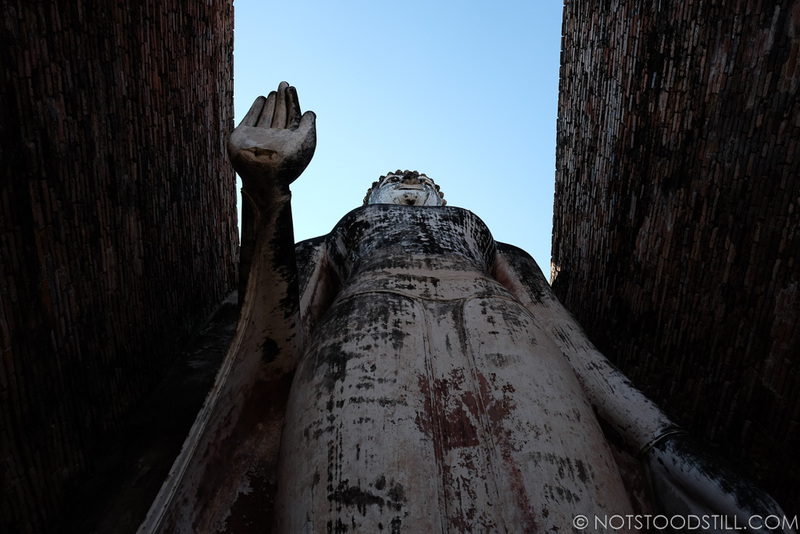 These ancient temples are perched on top of hills, with some providing great views. 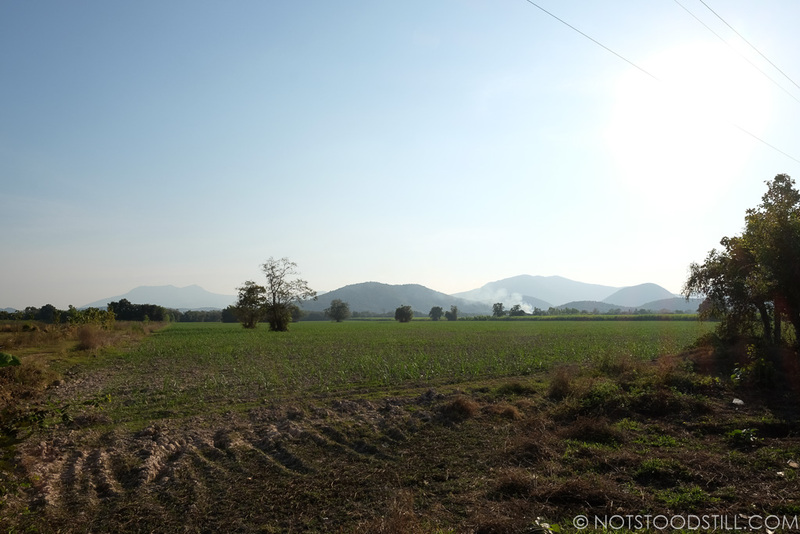 You can do a circular, passing some beautiful rural scenery eventually you approach the old city wall. Exploring the outskirts of the main park. 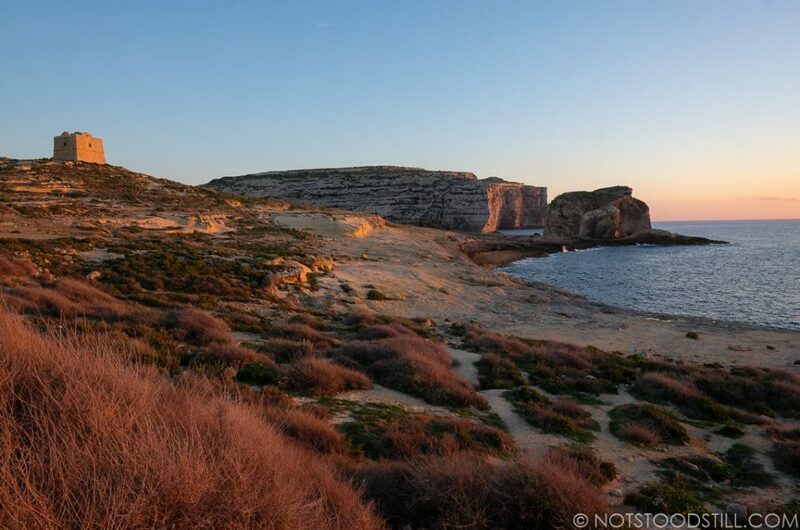 The new town has numerous cafes and restaurants which is why we chose to stay there rather than the old town itself, which only has limited options. For a good breakfast you should check out Mai Pra Dit Coffee & Bistro or Pai Restaurant (Pai is also great for dinner too). There is also a market to explore and of course many, many food stalls by the streets. New or Old City? 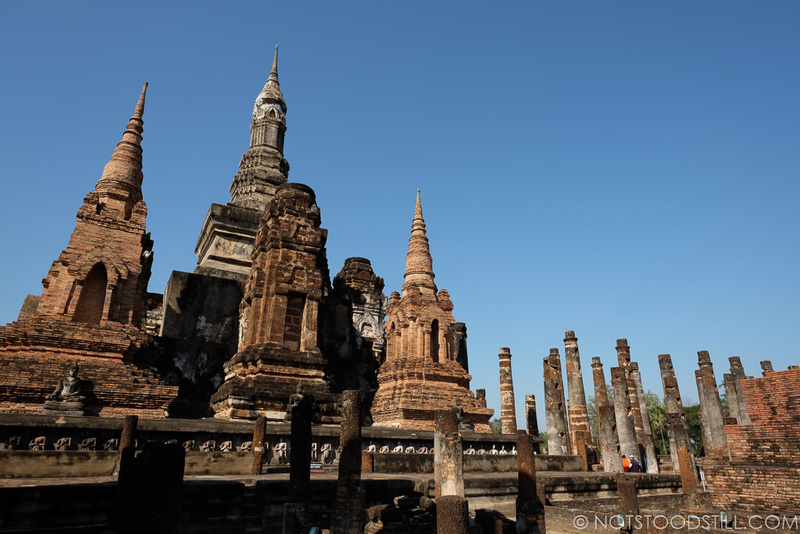 It doesn’t matter where you stay, both are well connected by a regular bus service costing 30 baht each way and takes about 30 minutes for the journey. For long bike rides, ensure you pack enough water with you as the daytime heat can be extreme. 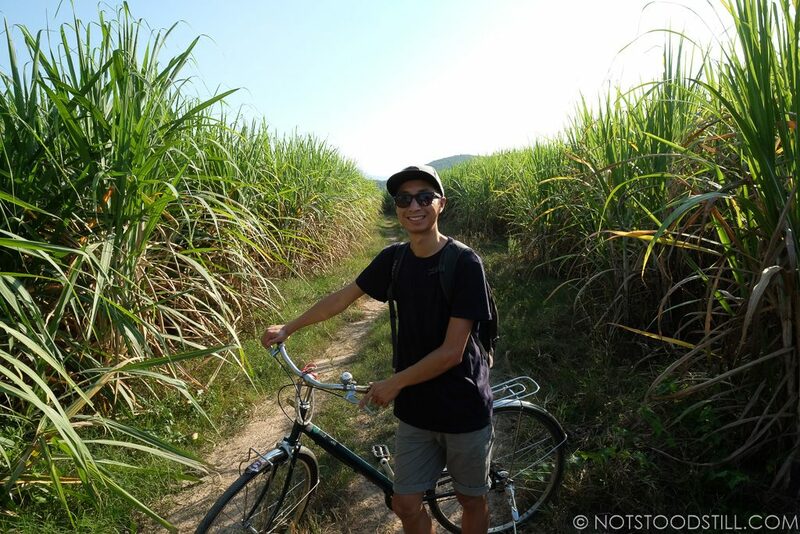 There are bicycle tours if you enquire at your accommodation, where they can take you nearby villages, sample local rice wine and see rice paddy fields. Other ruins outside the main wall, may incur an additional admission fee.